Berlin (AP) — Germany, England and Poland all took another step toward World Cup qualification but the Netherlands’ failure to do the same cost national coach Danny Blind his job on Sunday. The Dutch football association fired Blind one day after his team’s humiliating 2-0 defeat to Bulgaria in Sofia — a result that leaves the 2014 World Cup semifinalist in danger of missing out on a second successive major tournament after watching Euro 2016 at home. The Netherlands are fourth in Group A behind France, Sweden and Bulgaria. Only the top team in each group qualifies automatically for next year’s tournament in Russia. On the field Sunday, defending champions Germany remained on course with their fifth win from five games despite conceding their first goal in Group C. They beat Azerbaijan 4-1. England, now the only team not to have conceded so far in European qualifying, beat Lithuania 2-0 in Group F. On an emotional day, Jermain Defoe led England out onto the pitch with a terminally ill five-year-old mascot by his side and then scored in front of him. In Group E, Poland captain Robert Lewandowski scored again as his first-placed team beat second-placed Montenegro 2-1. Germany stayed perfect in qualifying despite conceding their first goal of the campaign in a 4-1 away win over Azerbaijan. Little-used forward Andre Schuerrle scored two and set up another. Germany have scored 20 goals so far in their group and next face last-placed San Marino, who have conceded 23 goals already. The world champions lead by five points from Northern Ireland, who defeated Norway 2-0 in Belfast thanks to first-half goals from Jamie Ward and Conor Washington. The Czech Republic, who racked up a 6-0 win in San Marino, are two points further back, one ahead of Azerbaijan. Two each from Antonin Barak and Vladimir Darida, and goals from Theodor Gebre Selassie and Michal Krmencik, gave the Czechs their biggest ever away win. Poland captain Robert Lewandowski scored for the 10th straight European qualifier to set his side on their way to a 2-1 win in Montenegro to consolidate top spot. The home side equalized through Stefan Mugosa’s first international goal but Lukasz Piszczek claimed Poland’s winner late to open up a six-point lead and leave Montenegro in a four-way scrap with Denmark, Romania and Armenia for second place. Montenegro are level with Denmark on seven points after the Danes’ goalless draw in Romania, who are level with Armenia a point further back. Despite starting with three straight losses, Armenia revived their hopes of a playoff spot by defeating Kazakhstan 2-0 at home for a second consecutive victory under new coach Artur Petrosyan. Bottom side Kazakhstan had Sergey Malyy sent off with his second yellow card with less than half an hour remaining, and Henrikh Mkhitaryan struck nine minutes later before Aras Ozbiliz sealed the win. 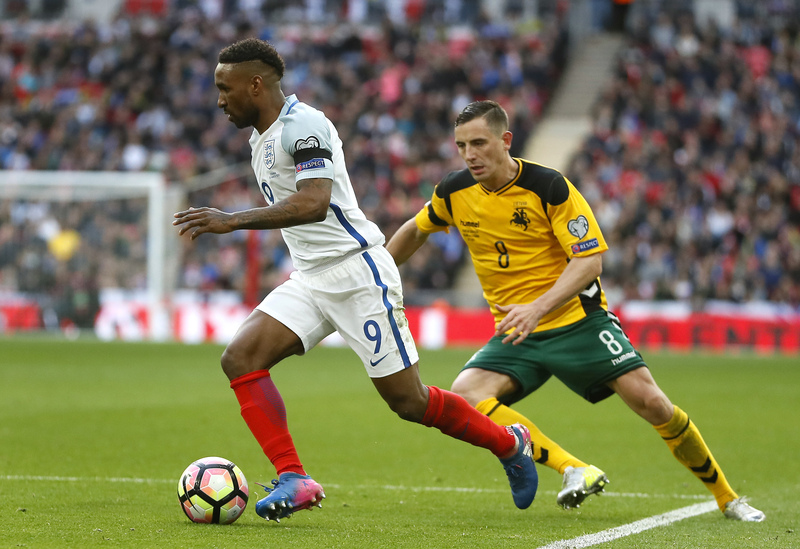 Jermain Defoe made an emotional return from exile to lead England to a 2-0 win over Lithuania at Wembley Stadium. Though Joe Hart wore the captain’s armband, Defoe led the side out onto the pitch with a terminally ill five-year-old mascot, cancer-stricken Bradley Lowery, with whom the Sunderland striker has formed a bond. With Lowery watching on, the 34-year-old Defoe then scored his first England goal for four years, striking 21 minutes into his 56th appearance. Raheem Sterling glided through the defence and provided a sweet cross for Defoe to net his 20th international goal. Defoe played almost an hour before being replaced by Jamie Vardy, who scored with his first touch to wrap up the win for England to extend their lead to four points following Slovenia’s first defeat. It was neighboring Scotland that did England the favor, beating Slovenia 1-0 thanks to Chris Martin’s late goal. Scotland climbed to fourth place and are only two points behind Slovakia, who moved into second by beating Malta 3-1 away.